Claire, what a clever idea! Beautiful! I love your wreath! The flowers turned out great! Thanks for sharing! I know it looks lovely in your home! Blessings from Bama! Enjoyed the flowers you made. You ought to post about how you made those. What a very cute project! Great job! That turned out very pretty! Gotta love Goodwill! that is so cute! I would love to make that for my front door. LOVE!!! And I would say you had some fun!! Being creative is always fun! Its the little touchs that really pop on this wreath. Love the eggs!! Love the flowers on this!!! Thanks for finding me thru Layla! I deleted my first comment so I could say more. I love the inventiveness and resourcefulness that this wreathe demonstrates. It is obvious that your nest IS Blessed! So pretty...don't you just love burlap...except for the "ravels"!!! Thanks for stopping by and following me @ Jeremiah 29:11. I'm your latest follower, too! HOPE you have a great weekend! Oh, this looks wonderful! I LOVE burlap, and you did a great job with it! What a great wreath! i love the bird touches, great job. Thanks for stopping by my blog and inviting me here! :D I love your wreath. It is AH-dorable. Thank so much for stopping by via Layla's party. I am your newest follower. I love your wreath! Thanks so much for sharing! I love your wreath - makes me think of spring, with the adorable bird eggs! What fun to discover everything you needed right on hand. This is a wonderful wreath! Love the pretty, soft colors! Very, very cute!! I love how you used what you had to turn a wreath frame into something so clever! Well done! Adorable wreath thank you for sharing I am a newbie here from Ohio!!! Oh my, this is lovely. I think I just found my inspiration for my spring wreath. 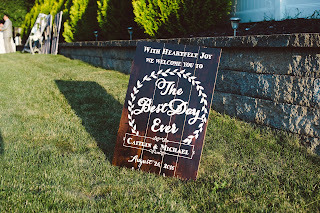 This turned out simply lovely - I especially like that you added a couple touches to the sign to tie it all together! Great wreath!